Classic cars, valuable antiques, and heirloom jewelry. Sure, we love “old” things, but not everything ages like a fine wine. One thing you absolutely do not need is an outdated set of windows. 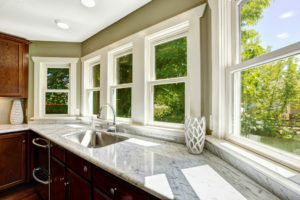 Here are the top five reasons you should invest in energy efficient windows for your home. One of the biggest reasons homeowners opt for energy efficient replacement windows is the appeal of a lower heating bill. Some homeowners have seen savings of hundreds or even thousands of dollars annually by installing energy efficient windows. In fact, the US Department of Energy considers replacing windows to be one of the most effective ways to increase the energy efficiency of your home. Have you ever noticed that your furniture, floor, books, and other décor have started to look sun-faded even though they’re inside? It’s likely because your old windows are allowing UV rays to penetrate into your home. Modern energy efficient windows are made to block UV rays from entering your home, which means your furniture will be protected from fading. Old windows can be hard to open, break easier, prone to moisture and mold, and even dangerous. Installing replacement windows reduces the amount of time and money you’ll have to spend repairing and maintaining your windows. While replacing windows is a bigger investment upfront, the time and money saved by not having to deal with so many repairs may be well worth it. According to this report from Remodeling Magazine, replaced windows can increase home value up to 75% of the original project cost. So not only can you enjoy the benefits of energy efficient windows while you’re living in your home, but you’ll be able to sell your home for more money should you decide to list it in the future. To a home buyer, new windows mean fewer maintenance and repair costs, lower energy bills due to increased energy efficiency, and curb appeal. Ask any realtor and they’ll tell you that homes with energy efficient windows sell faster, easier, and for more money. If you live in a city, you know how exhausting constant noise from outside your home can be. Even if you live in a suburban neighborhood or rural town, you’re not exempt from unwanted noise of neighbor’s lawnmowers or construction across the street. While no windows can block 100% of outside sounds from making their way indoors, there are “soundproof” windows that can reduce noise pollution by up to 95%. Replacing your home’s windows comes with a lot of great benefits, and these are just a few! You’ll save money, add value to your home, and be able to enjoy your new windows for years. If you need help picking out the right windows for your home, have questions about installation, or are ready to schedule your home’s window replacement, give us a call! We are eager to hear from you.